Abdominal ultrasound demonstrated several hypoechoic masses within the anterior lower abdomen. The largest mass measured 3.0 cm × 2.3 cm × 2.7 cm, and the scan demonstrated color Doppler flow within the mass. 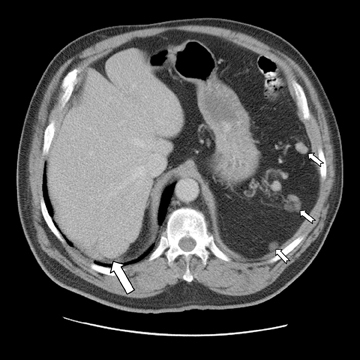 A follow-up abdominal and pelvic contrast-enhanced CT scan revealed multiple round, homogenous masses of similar densities in the abdomen. 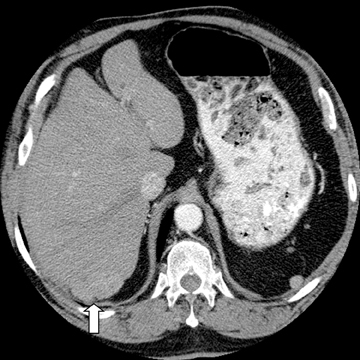 Several masses were noted within the splenic bed (Figure 1). The largest mass measured 3.8 cm × 2.7 cm and involved segment 7 of the liver. A satellite mass located nearby measured 2.3 cm × 1.6 cm (Figure 2). The 2 masses may actually have represented one lobulated mass. The lesions were highly suspicious for splenosis given the patient’s history of trauma with subsequent splenectomy. A 99m-Tc-labeled heat-denatured erythrocyte scan was recommended for further evaluation and confirmation. Incidentally, a simple renal cyst was noted involving the right kidney (Figure 3). 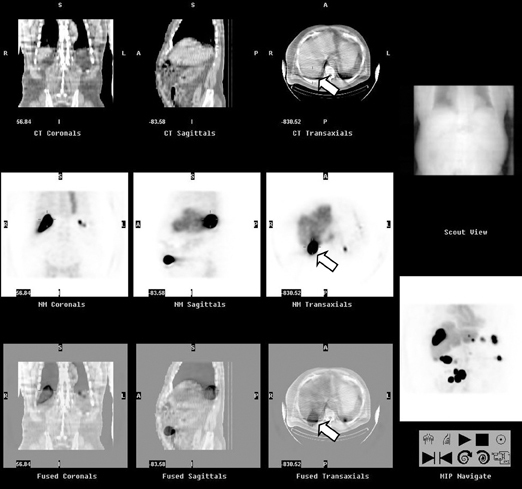 Heat-denatured labeled-erythrocyte single photon emission computed tomography (SPECT) scintigraphy with single-slice CT scan fusion was performed on a GE Infinia/Hawkeye system. 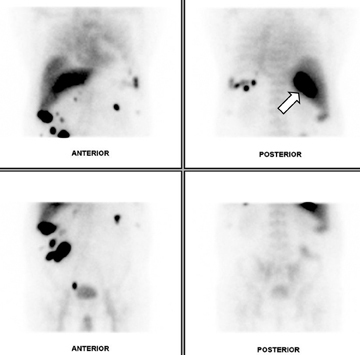 Multiple areas of abnormal radiopharmaceutical accumulation in the abdominal cavity and liver (Figure 4), corresponding to the masses, demonstrated nicely on the fused images (Figure 5), particularly in the posterior segment of the right hepatic lobe. These findings were consistent with the diagnosis of splenosis with intrahepatic involvement. The term “splenosis” was first used in 1939 by Buchbinder to describe a case in a young woman thought to have endometriosis.1 Splenosis is defined as the autotransplantation of splenic tissue, usually occurring months to years following abdominal trauma involving rupture of the splenic capsule. CT imaging shows 1 or more homogenous, solid, and non-calcified nodules. A diagnosis can be made by demonstrating uptake of 99m-Tc sulphur colloid or 99m-Tc-labeled heat-denatured erythrocytes within the splenules,2 although the latter has higher specificity. At the time of this writing, more than 100 cases of splenosis had been reported, with incidence of splenosis after splenic rupture as high as 76%.3,4 The splenic tissue can implant in various locations. These include, in descending order of frequency: the serosal surface of the small intestine, greater omentum, parietal peritoneum, surface of the large intestine, mesentery, undersurface of the diaphragm, and the thorax.5,6 As in this case, however, intrahepatic splenosis is rare, with only a handful of cases found in the literature. Splenosis is mostly seen in young males, due to the higher incidence of splenic injury within this group. The latency period between splenic injury and detection of splenosis is between 5 and 10 years in most cases.7 According to the literature, the longest latency period reported is 43 years.8 This case demonstrates a latency period of 64 years, making it the longest such period discovered outside the current literature. Splenosis is notorious for mimicking benign or malignant neoplastic processes that can lead to a very expensive work-up. In this case, the patient had a history of splenectomy at age 11 and was unaware of any previous work-up for remnant splenic tissue. Splenosis should be considered in the differential diagnosis of a liver mass in a patient with history of splenic trauma or splenectomy. Accounts of misdiagnoses based upon ultrasound and CT studies showing intra-abdominal masses can be identified throughout the literature. Therefore, it is important to acquire a thorough history, focusing in particular on any remote history of abdominal trauma. Although the spleen was clearly absent on this patient’s CT scan, determining the hepatic mass as a case of intrahepatic splenosis without more invasive means, such as a tissue biopsy, would have been difficult without scintigraphy. 99m-Tc-labeled heat-denatured erythrocyte scintigraphy is a relatively noninvasive means of investigation with a high specificity and sensitivity for remnant splenic tissue. Also, as demonstrated in this case, it is possible to have a remote, up-to-65-year history of splenic trauma with later findings consistent with splenosis. Buchbinder JH, Lipkoff CJ. 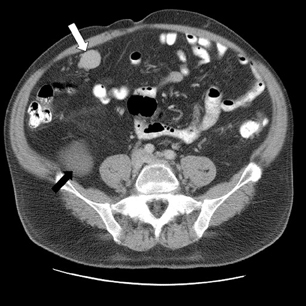 Splenosis: Multiple peritoneal splenic implants following abdominal injury: A report of a case and review of the literature. Surgery. 1939;6:927-934. Grainger RG, Allison DJ, Adam A, Dixon AK. Grainger & Allison’s diagnostic radiology: A textbook of medical imaging, 4th ed. Harcourt Publishers Ltd, 2001;3:3000. Durand DV, Joliot AY, Beaumont X, Levrat R. La splenose: Revue de 117 observations. Gastroenterol Clin Biol. 1981;5:758-764. Losanoff JE, Jones JW. Splenosis after laparoscopic splenectomy. Surg Endosc. 2001;15:1497. Fleming CR, Dickson ER, Harrison EG. Splenosis: Autotransplantation of splenic tissue. Am J Med. 1976;61:414-419. Pumberger W, Wiesbauer P, Leitha T. Splenosis mimicking tumor recurrence in renal cell carcinoma: Detection on selective spleen scintigraphy. J Pediatr Surg. 2001;36: 1089-1091. Brewster DC. Splenosis: Report of two cases and review of the literature. Am J Surg. 1973;126:14-19. Galloro P, Marsilia G M, Nappi 0. Hepatic splenosis diagnosed by fine needle cytology. Pathologica. 2003 Feb;95:57-59.